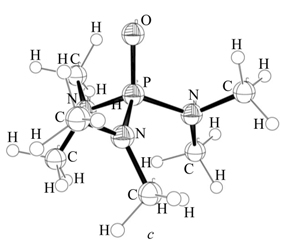 Based on the DFT computations, the structural models have been constructed and the spectral characteristics have been computed for complexes of uranyl chloride and uranium tetrachloride with two HMPA molecules (UO2Cl2•2HMPA and UCl4•2HMPA). The computations have been performed using the hybrid B3LYP functional in the effective core potential approximation LANL2DZ for a uranium atom and with the use of the all-electron basis set cc-pVDZ for other atoms. It has been shown that complexation is accompanied by significant structural changes in the central fragment. The derived spectral characteristic have been analyzed and correlated with the experimental data. The spectral features characterizing the complexation process have been determined. Adequacy of the proposed models has been tested; agreement between the computational results and experimental data has been demonstrated.